The devil has taken his powerful bike out for a ride in this motorcycle game. 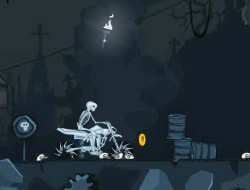 The tracks he rides on arent exactly standard as it likes the dark graveyards and caves. The wheels are made of spikes so the grip will be fantastic. Unfortunately there are lots of traps you will have to avoid in this motorcycle game whilst trying not to crash the bike or the rider. You can switch directions with the push of a button and this will come in handy as it might save you from a fall and the roads will take sharp turns every now and then. Use the arrow keys to drive and Space to change directions. Devils Ride 2 0.00 between 0 and 10 based on 0 votes.